In 1617, eleven-year-old Jeremiah Clements arrived on the shores of the New World with his mother, Elizabeth, and three siblings. Unfortunately, Jeremiah’s father – Geoffrey Clements, a stockholder in the Virginia Company – died before his dream of coming to Jamestown could be fulfilled. So Elizabeth – filled with courage, fortitude, and determination to carry out that dream – left England and sailed with her family and other settlers to Jamestown, the first permanent English settlement in the Americas. 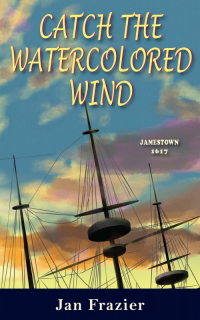 As seen through Jeremiah’s eyes, Catch the Watercolored Wind: Jamestown 1617 is an exciting story that explores the tragedies, adventures, and incredible achievements of those early colonists. Come walk with Jeremiah as he grows from an innocent young boy into a strong, confident young man as a new country takes shape around him.